I’m not sure if it was something to do with the three quarters of a bottle of Sauvignon Blanc I drank last night, or more likely the chicken fajitas I cooked and devoured quite late in the evening, but at 3AM this morning I was sat bolt upright in bed, in something of a daze but in need of something to get me back to sleep. I went downstairs and made myself a cup of Ovaltine Options Lite (formerly known as hot chocolate). The house was deathly still as my brother was out for the night and the very faintest of glows from the rising sun could be made out across the horizon through the kitchen window. 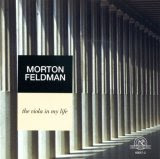 I felt the need for music, and for some reason I was in no doubt which CD to put on, and almost instinctively selected the New World reissue of Morton Feldman’s The Viola in My Life that features Karen Phillips’ viola and David Tudor’s piano, directed by Feldman himself. With the volume turned right down I sat and watched clouds move slowly across the sky as this stunningly beautiful music unfolded into the room and I clutched my mug. Before the three parts of The Viola… had ended half an hour later I think I was asleep again. For years I have used Feldman to lure me gently off into slumber, but not this disc before. Now, some six hours later the memory of that moment seems even clearer than it did last night, and I’ve pressed play on the CD deck again to remind me just how fantastic that piece of music is. And I’ll have to try some of that “Chauvignon Blanc” stuff sometime. Is it anything like Sauvignon Blanc?